Market Street Bridge | Just Shooting Memories! Some cities are more photogenic than others. Chattanooga is definitely on the more photogenic end of the list. 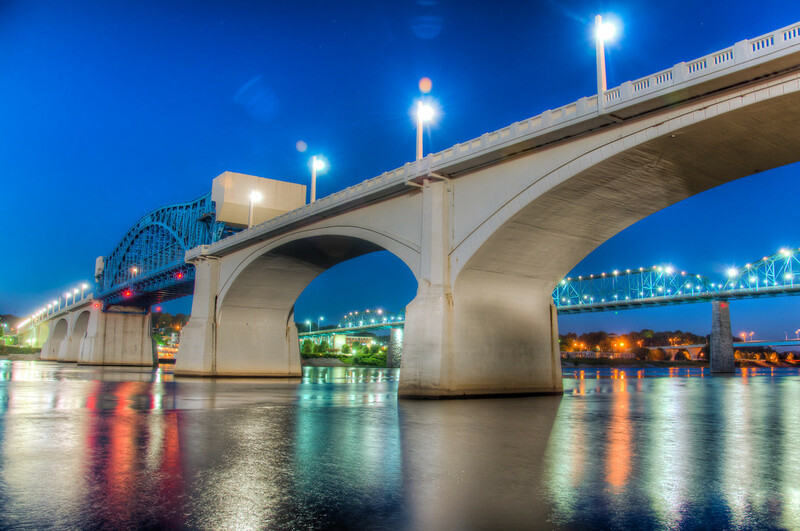 This is the John Ross or Market Street Bridge which is near the Chattanooga aquarium. I have walked over this bridge several times and always love the views from the bridge. I was excited to be able to get a decent angle to capture it at night. This shot was from beside the water cannons at Ross’s Landing. Great night shot. Very nice colors and reflections. I wonder if that draw bridge ever goes up? Thanks, Tim. In all the times we have been near this, I have never seen the bridge up. I have seen plenty of barges, but nothing large enough to require raising the bridge.